For those of you still unfamiliar with Snapchat, the app has these things called geofilters — a design or image you can overlay on your photo or video. The geofilters are a fun way to show your location, and the best places have multiple geofilters that reflect the various aspects of where you are — whether it’s a city, landmark, neighborhood or event site. Metro launched the first series of station geofilters a few months back because our stations help define the characteristics of different neighborhoods. We have since activated more stations with geofilters and even created temporary geofilters for Metro-sponsored events such as Bike Night at Union Station and CicLAvia. Before I get into which stations now have geofilters, I thought it’d be fun to check in with the two Metro designers responsible for creating them. I sat down with Jamal Polk and Jennifer Bahng to get a little background on how Metro is making its mark on Snapchat. Slightly camera shy designers hard at work. First of all, are you a Snapchat user? Jamal: I use Snapchat on occasion, but I’ve always been a slow adapter when it comes to technology. However, I am a fan of the geofilter. I’m a Georgia transplant so the geofilters are a quick way for me to get to know where neighborhoods start and end in this city. They help me get a feel for the place is like. Jennifer: I’m not a Snapchat user. ☹ But I appreciate geofilters…they’re different from other platforms since they are only activated when people are actually on the spot. Do you think geofilters reflect the character of a community or neighborhood? Jamal: I think so, but in a broad, general way. Sometimes I feel like they show neighborhoods stereotypically — it’s more like your idea of what the neighborhood should be, not what it actually is. Jennifer: I feel like they’re a form of psychogeography — an approach to geography that emphasizes playfulness. The geofilters sort of paint the identity of each station’s neighborhood, so outsiders can see the natural and cultural environment. But there are limitations in terms of authenticity. None of the filters delve into serious issues that are part of the make up of communities. When designing a Metro geofilter, what are some things you have to take into consideration? Jamal: The first thing we take into consideration is what the place is known for. Why would someone go here? And does a geofilter already exist for this location? If so, how can we make ours unique? We have to consider the colors and how they might display on people’s photos. There are size and placement design restrictions. Plus, each filter has to include the station name using our signage font, DIN. Jennifer: I tried to illustrate significant landmarks and objects that are related to each station, but staying within the Metro style guidelines, i.e. using bold outlines, bright colors and rounded edges. Of the current Metro geofilters, which one was your favorite and why? Jamal: My favorites would have to be the ones we did for Bike Month. Our normal filters are permanent, so they will always be there, but it was nice knowing that these were event specific and would be temporary. I like the idea of limited edition filters. Jennifer: 103rd Street/Watts Towers Station since it took the longest to create. The architecture of Watts Tower is complex and it took a long time to illustrate. Looking forward, is there a station you would like to create a geofilter for? Jamal: Not so much a specific station, but probably doing some for the bus lines. I ride buses more than I do rail, and it would be nice to show a few of the lines some love, like the Rapid 733 and 754. The filters would probably be generic but change location name display depending on which stop you were at. Jennifer: Possibly Union Station? There are currently geofilters for Union Station but they weren’t done by Metro. I’d like to make one using the station’s art deco façade. If you’re on Snapchat and have an opportunity to use a Metro geofilter, we’d love to see it! 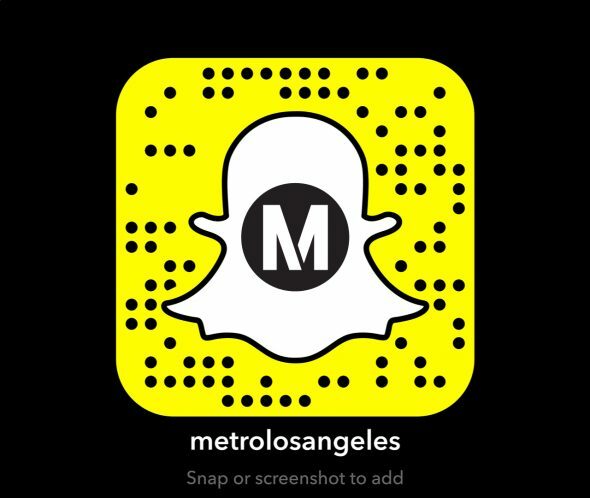 Send us your snaps, or follow us @metrolosangeles to see them featured.